As you may have already heard, Defra announced on 19th December that all outdoor uses of metaldehyde are to be banned from spring 2020. We understand that this is very disappointing news for the industry, especially with the hard work many of you have put into our projects to help protect water. It is worth noting that the ban is not because metaldehyde has been polluting drinking water sources. The decision follows advice to government from the UK Expert Committee on Pesticides and Health and Safety Executive that metaldehyde poses an unacceptable risk to birds and mammals. It will be legal for distributors to sell metaldehyde products up until the end of June 2019, with use of the products then allowed for a further 12 months. In preparation for the phasing out of metaldehyde, consider reducing your reliance on chemical control measures by adopting a wider range of options in your Integrated Pest Management (IPM) programme to control slug numbers. If you need to use chemical control, use ferric phosphate-based pellets instead of metaldehyde and, as always, follow stewardship and best practice guidelines. In some areas there are water company funded initiatives available to support you until the ban comes into force, so contact your local water company to find out more. Note that contact details can be found at the bottom of this update. 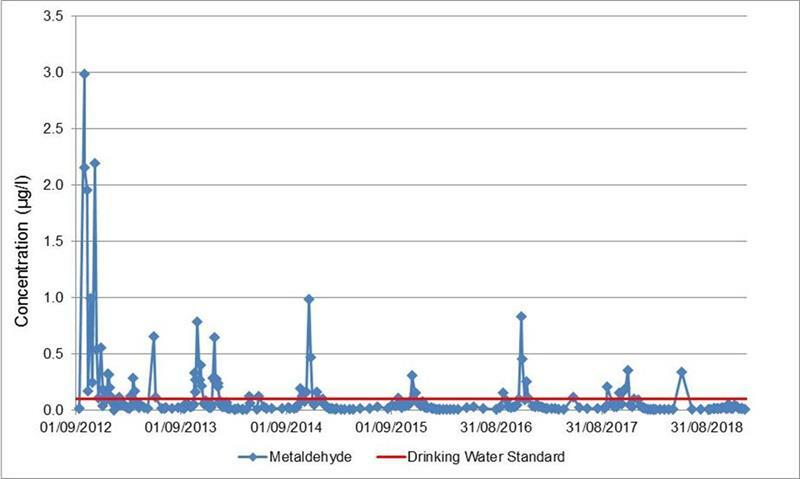 The latest results show that metaldehyde concentrations across all 12 monitoring sites have remained well below the drinking water standard this week. Recorded concentrations have been significantly lower with 11 of the 12 monitoring locations at or just above the laboratory limit of detection for metaldehyde. The start of the New Year has been particularly dry and it is likely that this has had a part to play in the results observed. The only site to deviate from this trend is the Colne at Staines with a concentration of 0.022µg/l, still significantly below the drinking water standard. If you do need to make any further slug pellet applications in the coming weeks please consider water protection, use ferric phosphate-based pellets and, as always, follow best practice guidelines (www.getpelletwise.co.uk). 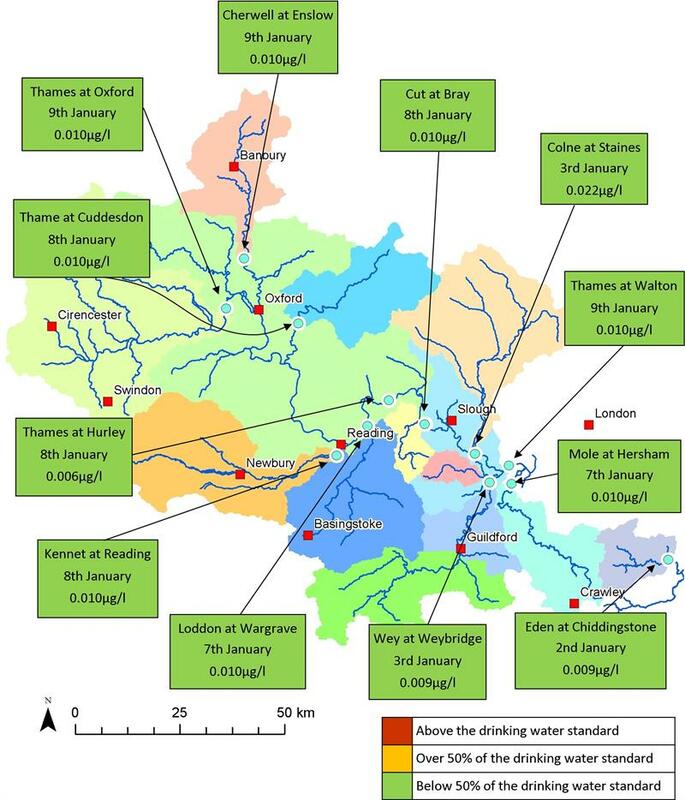 Metaldehyde concentrations in the River Thame at Cuddesdon have previously exceeded the drinking water standard 64 times since monitoring began in 2012. Concentrations were particularly high from autumn 2012 to autumn 2014, with 39 of the 64 exceedances recorded in this two year period alone. The highest concentration recorded at the River Thame at Cuddesdon was in autumn 2012 with a peak of 2.98µg/l, nearly 30 times the drinking water standard. However, so far this season, concentrations have remained below the 0.1µg/l standard.